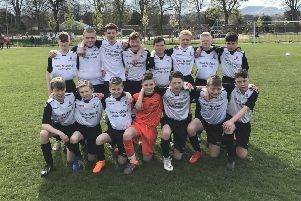 Portobello High School created some Capital footballing history last week when their Senior 1, Senior 2 and Senior 3 sides all won their respective Edinburgh Schools League Cup trophies. The S1s [under-13s] defeated Firrhill 4-1, the S2s [U-14s] overcame Queensferry 2-1 after extra-time and the S3s [U-15s] triumphed 2-0 over Craigmount. In doing so, they ensured Porty became the first secondary school to hold all three trophies at the respective age groups since Tynecastle in 1960. “Our under-13s are really strong,” explained Jamie Stewart, PE teacher and Football Co-ordinator. “They’ve also won their league and reached the semi-final of the Scottish Cup. The U-14s won it last year as well against Queensferry and beat them again this year, although Queensferry won the league. I take the S2 team and didn’t really expect them to win, to be honest! Since the new school opened in October last year, pupils have had access to vastly improved sports facilities, including several 3G pitches, which Stewart has partly attributed their on-field success to. “Having the pitches on the doorstep has made a huge difference,” he said. “In the past it was difficult to keep the boys interested if you’re not getting games every week. With pitches being called off often, having the 3G at the school is perfect because if it looks like the weather is going to be bad, we can always suggest playing at the school or play games back to back. We didn’t always have the option to do that at Cavalry Park. As football co-ordinator, Stewart is responsible for making sure all Portobello teams have regular fixtures and training sessions and believes a more integrated approach to football has helped. “We have training sessions on at lunch times where S1 to S3 can play seven-a-side on certain days,” he said. “Our S5 pupils come in and take those seasons as well as coaching the teams on a Saturday, so it’s good getting the senior pupils involved as well. With a number of pupils on the books of Hearts and Hibs, Stewart is hopeful many can follow the example of Andrew Irving, who previously played under Stewart and is currently full-time at the Tynecastle club’s academy. “Andy still comes in to school every Wednesday as he’s still doing a couple of certificated classes,” Stewart said. “It’s good to catch up with him when he’s in and use him as an example for other boys to aim towards. We’ve got another boy in S5, Ciaran Brian, who’s leaving to go full-time with St. Johnstone and he coached the 13s this year.